I grew up near a mythical river: the Wanki, which runs along the border that today separates Honduras from Nicaragua. I hold on to fond childhood memories of swimming across that river with my sisters to water crops, learning to fish with the women and of working together shelling beans. It was the forest, the plain and the river that provided food, soap and toys for our communities. I learnt that each and every form of life in nature has its own spirit which gives it its own particular attributes. We Miskitu women have a special relationship with our land – that sacred space that cannot be sold or divided up. For Indigenous People, land is community. It is living in harmony with Mother Earth. Our collective identity and sense of belonging is embedded in the land and so too our legal, political, economic and social systems. And it is not just Miskitu women. Indigenous women all over the world have this special relationship with land and territory. We are transmitters of knowledge, persevering our cultures, systems and the ways our Indigenous Nations and Peoples organize. We contribute to the diversifying agriculture and other productive activities, we ensure the functioning of economic systems founded on reciprocity and complementarity, and we participate in the collective environmental services of our communities. However, our role as traditional protectors of our territories is being severely threatened. The grabbing of land and natural resources combined with the impact of climate change is having a devastating effect on the lives of indigenous women. In its latest annual report, the International Work Group for Indigenous Affairs (IWGIA 2016) highlighted, with concern, that the Paris Agreement on Climate Change does not fully include a gender equality perspective nor acknowledge the fundamental role that indigenous peoples play in the fight against climate change. Enforced displacement, environmental degradation, serious health problems and conflicts over increasingly scarce natural resources are just some of the consequences suffered by indigenous women due to the indiscriminate exploitation of our territories. The loss of natural resources and biodiversity is also the loss of our traditional roles. The transformation of ecosystems in to monetary economic systems and changes to local, social and decision making structures as well as lack political recognition by governments also impacts negatively on women. Women often don’t have access to land ownership and tend to be more excluded from decision-making and the administration of communal property. Just like women all over the world indigenous women also suffer domestic violence within our communities. This situation of violence is exacerbated by land grabbing, rising land and food prices and other factors which characterize extractive economic models. The violence that indigenous women and girls experience represents multiple forms of discrimination and defies any simple categorisation. It is multidimensional in nature, and cannot be separated from colonisation and its effects or from the forced disintegration of community structures and traditional territorial governance systems. The systematic infringement of the collective rights of indigenous peoples presents a significant risk where gender based violence is concerned. For indigenous peoples and in particular women, the right to land and territory guarantees the reproduction of our way of life and enables us exercise our right to our own development. The words of an indigenous woman leader on the value and significance of land for indigenous peoples come to mind: “When indigenous people are born, they sing to us, they tell us where we came from, where our two grandmothers and two grandfathers came from and their territorial history, which is also our territorial responsibility”. The lives of some 2.5 billion people, including 370 million Indigenous people, depend on lands and natural resources that are held, used or managed collectively. They protect more than 50 per cent of the worlds land surface however, legally they own just one fifth of it. In March this year a Global Call to Action on Indigenous and Community Land Rights was launched which aims to double the global area of land legally recognized as owned or controlled by Indigenous Peoples and local communities by 2020. As organisations and people from all over the world mobilise in favour of land rights for indigenous women, it is worth to remember that violence against women and girls is not just a matter of individual rights, but of collective rights too. 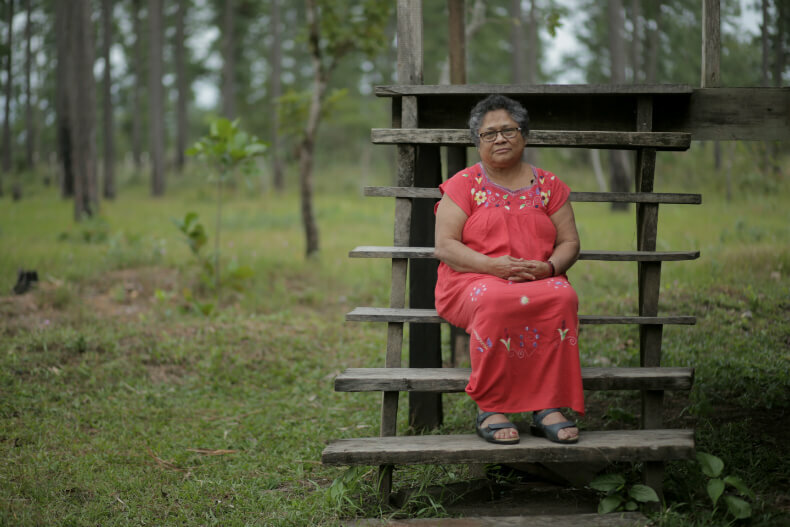 Myrna Cunnigham, a Miskita feminist and indigenous rights activist from Nicaragua. She served as the Chairperson of the United Nations Permanent Forum on Indigenous Issues until 2012. She is also the president of the Association for Women’s Rights in Development (AWID). This article was originally published by the Thomson Reuters Foundation. It has been republished at IC with permission.